Previous years' threads here: 2015, 2014, 2013, 2012, 2011, 2010. To reiterate, the guidelines are that you decide the criteria for why it's your best, technically or otherwise. However, please let us know that reason. After three years, I was able to make a return trip to the incomparable Karakoram Range, which features the finest mountain scenery on the planet. I've selected the above picture as my best one of 2016 because it features the most spectacular mountain I've ever seen: At 21,040ft Sosbun Brakk - which translates to "Wall-of-teeth Rock" in the local Balti language - may not be the tallest one in the region, but the balletic spires and conical shape make for an irresistible combination. Now a few words about the photo: This ice pool was located a few hundred yards from our campsite, at the edge of the Biafo Glacier. To get to this point (elevation ~16,000ft) we'd spent the past week walking atop the 42mi long glacier. The day before, I'd identified the lovely green pool as a nice shooting location. On this frigid morning, just before dawn, I scrambled my way down the unstable boulders to the pool, to find it wearing a light glaze of ice. Initially, due to overcast conditions, dawn was a no-show. And then, as the sun rose higher, a beam of light found a hole in the clouds and began to play on the craggy slopes of the magnificent Sosbun Brakk. It was as if the mountain was on fire. The show was over inside a few minutes, but this only made it all the more special. I love that Fire and Ice shot! I like to post in this thread, but always have a hard time with the concept of "the best." I have a handful of shots I really like from this past year and have trouble sorting them, but this is the one I'll pick for this exercise. 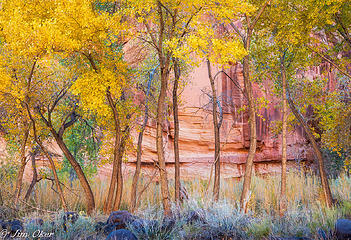 I shot it during a great photo workshop run by Jack Dykinga and John Shaw at Capitol Reef National Park. I haven't taken any photo lessons since a few semesters of classes in college, and it was truly great to spend a week with some fantastic photographers and teachers alternating between shooting and classroom time (spent on a mix of lectures and group critiques of each others' work). It really nudged me on a few fronts which I expect to pay dividends for some time to come. Later in my trip to UT, I met another photographer who suggested some techniques and related tutorials that I've been diving into as I process my RAW shots from this trip. Between these two experiences, I have a LOT of learning laid out for a while ahead, which is great. This shot is one of my two or three favorites from the trip, and some of the processing tips I got were necessary to get it to a point where I'm happy with the rendering. It was early morning, a bit after sunrise. The state highway that runs through the park was directly at my back, so this is hardly backcountry, but it's a beautiful spot nonetheless. The sunlight was bathing the high red canyon wall behind me in bright light, which was reflecting a reddish glow onto the trees and wall in this shot. But some of the foreground elements and a few branches were more heavily lit by the blue sky above, which yields a nice color contrast. One of the fun things to hunt while shooting in red rock country. The fall foliage helped pull it all together into a shot that pleases me. Back in the classroom, I shared this one for group critique, and Jack gave me what he called "my ultimate compliment" - "I wish I'd taken this shot! I'll have to kill you now..." :-) I think I'll be printing this one large for the wall. This fellow spent more than hour with us on Miller Peak. The shot is memorable because of the folks I was with and the length of time we were with goat. 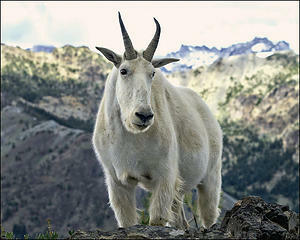 At one point, another hiker approached the summit mound but was reticent to come up because of the goat. When the goat started ambling down toward him, the hiker backed up, so we called down to him to just let the goat go by. He wasn't having that and turned back down the mountain. The goat followed him for a hundred yards or so until he disappeared. The goat then turned and came back up to us on the summit. Nikon D610, Nikkor 80-200mm f4 AIS. I love the glowing leaves in that photo. Compositionally, I really like the way the foreground rocks are separated from the background cliffs by the (prison) bars of the trees. Nice one! I love the detail on the tail, and the sense of motion. Nice shots everyone! 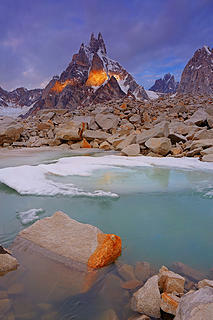 Gali, I'm envious of your Himalayan adventures. joker, that is a sweet shot with so many layers and colors (what was the processing tip that helped most on it?). Gil, love the selective focus that really makes the goat pop. BJ, nice lines in that one leading into the fall color. kite, good job catching the decisive moment so well. Fletcher, classic shot of a classic spot - love those peaks. I'm having a hard time choosing this year, so I'll just go with a recently processed shot (I'm always partial to those) from a fall trip to southern Utah. 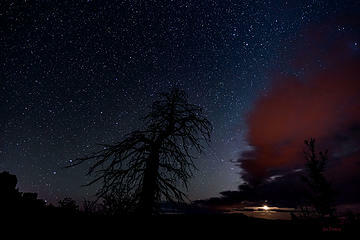 It is just a single shot from a night of time-lapse shooting in Bryce Canyon NP. I started out the night in my van, but set the alarm for 2 a.m. hoping to capture stars through sunrise. I climbed up onto a ridge next to the campground to a spot I'd found earlier where I could frame an interesting tree, and have a flat spot to lay out my sleeping bag next to my tripod to safeguard the expensive gear. All went well until about 4:30 when unexpected clouds blew in and I awoke to a rain shower. I hustled up out of my bag, grabbed all my gear and ran for the van where I went back to bed. In the end the clouds made for a more interesting time-lapse, although it was shorter than planned. The moon rise also added some color and interest. I love the time-lapse app on my Sony camera that allows me to sleep through the night while capturing the stars. (what was the processing tip that helped most on it?). If I were to go with just one, I'd offer the rather broad tip of "learn to use Photoshop well in addition to Lightroom!" Getting slightly more specific, I ran into another photographer while wading up the Virgin River Narrows who agreed with this tip, and added "learn about Luminosity Masks - I use them in so many different ways now." He pointed me to Tony Kuyper's blog, his TKactions V4 panel, as well as to Sean Bagshaw's for-purchase video tutorials (a few of which you can sample on YouTube, along with some other great videos by Greg Benz and others...). These things are not magic bullets and not applicable to all images (I used them here to good effect, but "select by color range" was probably even more important to how I worked this image, for instance...), but I'm finding I'm using them quite a bit now that I'm starting to get the hang of them. And the money I spent on Bagshaw's videos was quite well spent. Edited to add: Jack Dykinga also talked a bit about color perception and processing. He asserted that many people's photos of the SW look "jaundiced" and he encouraged us to notice the blue in shadows, for instance, which can be a thing to embrace rather than wipe out by dragging the color balance slider to the right in a quest to make red rocks even warmer. kite, that whale shot is fantastic! You need to put up a trip report with more photos...please. I'm sure a lot of us don't care. 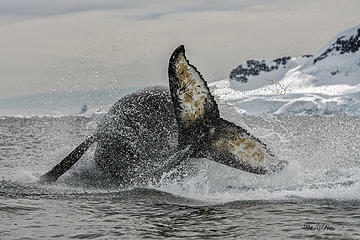 Love the Antarctic pics Kite! There were a few pics I was particularly pleased with this year, but this is my favorite. 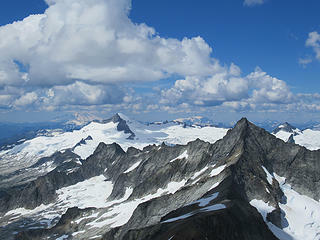 I prefer this crop vs. the landscape crop I entered in the calendar contest. Why is it my favorite? Well, I like the simple color palette and the warm feeling it gets from the late afternoon setting sun and the way it backlights the Hawk's feathers and creates a halo of the Hawk's form. 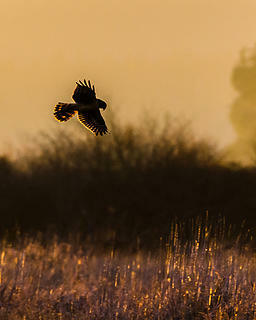 I also like the way you can really tell what the Hawk is doing - he's looking down into that tall grass for a meal. In short, the subject matter, lighting, and composition just came together for me in this one. The only thing I don't like about it is the grainy-ness of the background. It was necessarily shot at rather high ISO and Lightroom's noise reduction could only do so much without removing critical detail.